Since 1915, the coveted top spot for the Indy 500 has been fought through time trail sessions. A gateway to the ultimate desire of the Borg-Warner trophy, drivers and teams push to become the fastest on the Saturday session now known as Indy 500 Pole Day. For 2011, the race's first 24 starting spots is up for grabs through a time trail session where drivers a recorded through a four-lap, single-car run. After showing consistently fast speed in practice at the 2.5 mile Brickyard, Alex Tagliani and the #77 Sam Schmidt Racing team were still considered a long shot against the superteams of Penske Racing and Target/Chip Ganassi Racing. Cars from Penske and Target/Chip Ganassi combined to win the last 5 Indy 500 poles. Fortunate for the efforts of the #77 team, the strong showing in practice translated in Tagliani piloting a very fast Bowers and Wilkins. Holding a top speed through the afternoon, Alex Tagliani was last among a final 9-car qualifying challenge called the Fast Nine session. In the four-lap qualifying session, Tagliani clocked a time of 2 minute, 38.2613 second run averaging at 227.472 miles per hour. For the pole Alex Tagliani outpaced the Target/Chip Ganassi Racing #9 car of Scott Dixon. Having won the 2008 Indy 500 after gaining the pole for that year's race, Dixon's total time during his 4-lap time trial run was less than 1/10th of a second slower than Tagliani's pole-winning run. 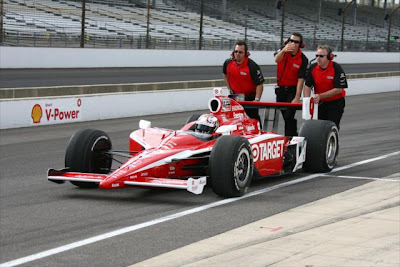 While Scott Dixon feel just short of pole, teammate Dario Franchitti's #10 also had a shot at the pole qualifying within the Fast Nine position. However, during his run in the Fast Nine session, Franchitti ran out of fuel on the race track. 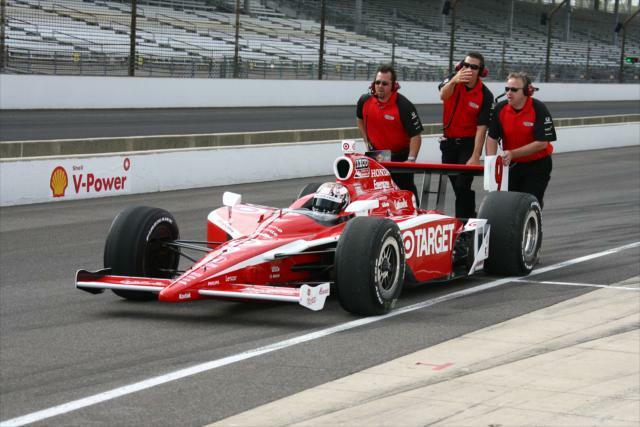 Because of the incomplete run, Dario Franchitti winds up 9th on the Indy 500 starting grid. In the 3rd and outside front row position, Oriol Servia mounted a strong qualifying speed of 227.168 miles per hour. Expressing extreme enthusiasm in the performance of his Newman/Haas Racing car in post-qualifying interview, Oriol Servia commented "I would have lost a lot of money because six months ago, a month ago, Monday, I would have not bet we were going to be in the front row and that close to pole position." Winning pole for 4 of the last 5 Indy 500 races, it was a mixed bag day for Penske Racing during the 2011 edition of Indy 500 Pole Day. For good news, IZOD INDYCAR Series 2010 championship runner-up Will Power proceeded to qualify strong for the 2011 Indy 500. Breaking into the Fast Nine session, Power ended up 5th overall for a second row starting start next Sunday. Triumphant in 2009 and 2010 editions of Indy 500 qualifying, Helio Castroneves endured an uncomfortable Pole Day with his #3 Shell-sponsored Penske Racing Indy car. Despite posting the fastest lap through a week of practice at 228.611 miles per hour as well as completing 274 laps around the 2.5 mile oval, Helio Castroneves and the Penske Racing team struggled to find speed on Saturday. Achieving a combined 4-lap average speed of 225.216 miles per hour, the 3-time Indy 500 winner Castroneves was only 16th fastest on the day. Helio Castroneves' difficulties in finding speed combined with more trouble in the Penske Racing team. In a qualifying attempt, the #6 car piloted by Ryan Briscoe crashed into wall after control slipped away from the Australian driver. Other qualifying runs made by Briscoe failed to secure the Penske Racing driver an Indy 500 starting spot on the first day of qualifying. The Indianapolis Motor Speedway provided a moment where drivers were given an intimate realization for the dangers of open wheel racing. On Thursday at the speedway, Simona de Silvestro driving the #78 crashed hard flipping in before coming to a rest. Suffering second-degree burns to her right hand and superficial burns to her left hand, de Silvestro returned for Indy 500 Pole Day. Only slightly below her rookie effort in 2010, Simona de Silvestro qualified into the field taking the 24th and final spot available on Saturday. Normally operating as a one-car team on the 2011 IZOD INDYCAR Series, the #77 car is joined by the #99 driven by Townsend Bell. Bell himself showed an impressive effort qualifying 4th for the Indy 500. On the second row, Bell will start alongside Will Power and 2005 Indy 500 winner Dan Wheldon. By claiming the top spot on the starting grid, ﻿Alex Tagliani records himself as the first Canadian to capture pole for the Indianapolis 500.